It is a good time to consider a regime-based conception of medium- and longer-term macroeconomic outcomes. Key macroeconomic variables including real output growth, the unemployment rate, and inflation appear to be at or near values that are likely to persist over the forecast horizon. Of course, the situation can and will change in the future, but exactly how is difficult to predict. Therefore, the best that we can do today is to forecast that the current regime will persist and set policy appropriately for this regime. If there is a switch to a new regime in the future, then that will likely affect all variables—including the policy rate—but such a switch is not forecastable. What´s missing is the acknowledgement that the “current (or any) regime” is the result of Fed decisions. In that case, if “further cyclical adjustment going forward is likely to be relatively minor” is mostly because the Fed is perfectly happy with the current regime. The panel below “defines” three “regimes”: The “Great Moderation” regime, the “Great Recession” regime and the “Depression” regime. While Bullard (who changes views much more often than the other FOMC members) is content with the “Depression” regime, many of the others, by constantly talking “rate hikes”, are fliting with a change to a “Deeper Depression” regime! If the global real interest rate is in the neighbourhood of 0% and expected inflation is in the neighbourhood of 1%, that suggests the Fed will have an extremely difficult time raising nominal interest rates beyond 1%. Mr Bullard has the regime right, but the causation wrong. The Fed has driven the economy into this rut in its determination to keep inflation low. and voilá, the myth is born! Partly thanks to Bernanke’s leadership (and knowledge), the Great Recession was not as bad as the Great Depression of the 1930s. Monetary policy reacted much more quickly, and financial institutions were (nearly all) bailed out. In 2009 we also enacted fiscal stimulus, but in 2010 we reverted to the policies of the early 1930s with fiscal austerity. That mistake was partly the result of panic following events in the Eurozone (see the IMF analysis discussed here), but it also reflected political opportunism on the right. That’s why it’s so important to get the facts right. Just as the Abe government showed the BOJ was not out of ammo in the early 2000s, a close examination of what the Fed did and didn’t do, and a cross country comparison of monetary policy during the Great Recession and recovery, shows that monetary policy is always and everywhere highly effective. 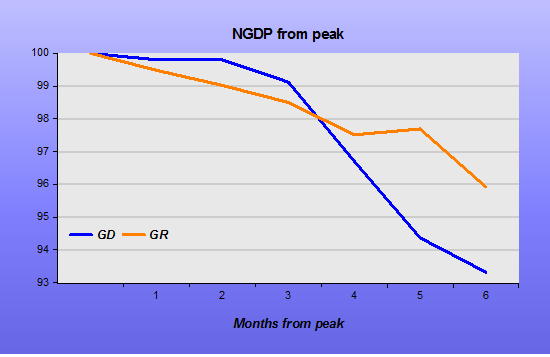 The chart shows that during the first few months of the Great Depression (GD) and the Great Recession (GR), the behaviour of NGDP was similar. After that, things were very different. 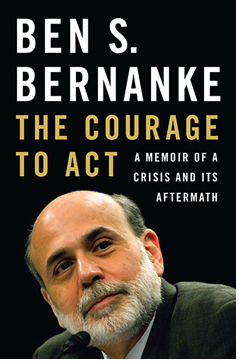 What Bernanke´s knowledge did was to apply the results from his “made my name” 1983 article “Nonmonetary effects of the financial crisis in the propagation of the Great Depression”, by going on a bank bail-out spree, thus avoiding the propagation factors that were very “active” in 1931/32. 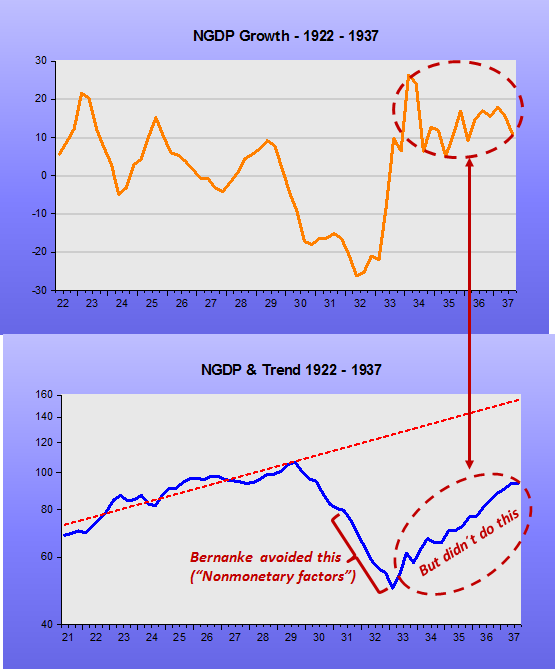 The charts from the Great Depression indicate what Bernanke avoided. They also show that to get the economy to “turn around” and take a path back to the previous trend, monetary policy has to be really expansionary. That was true even with interest rates at the ZLB, as happened when FDR made a significant change in the monetary regime, cutting the link to gold in March 1933, almost four years after the start of the depression! 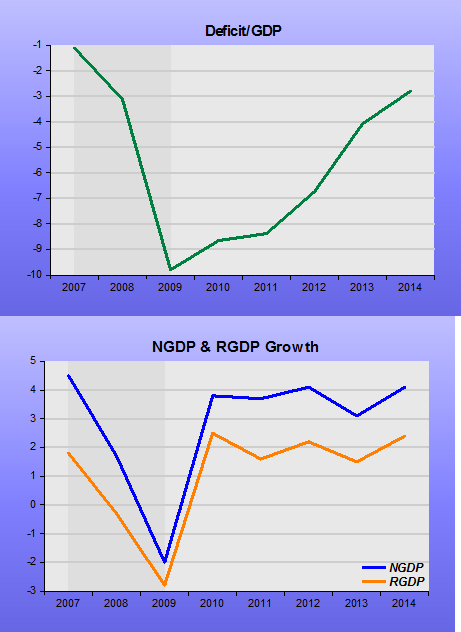 NGDP growth went up by enough to put the economy on the path back to trend. The next charts show what happened now. 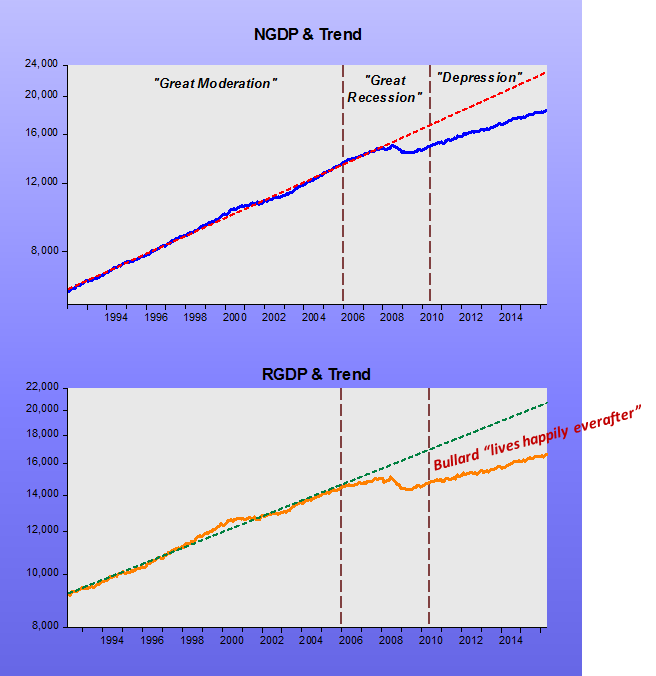 Notice that in the early 2000s, Greenspan also allowed NGDP to drop below trend, but that mistake was fully offset, and by the time Bernanke took the Fed´s helm. NGDP was back on trend. 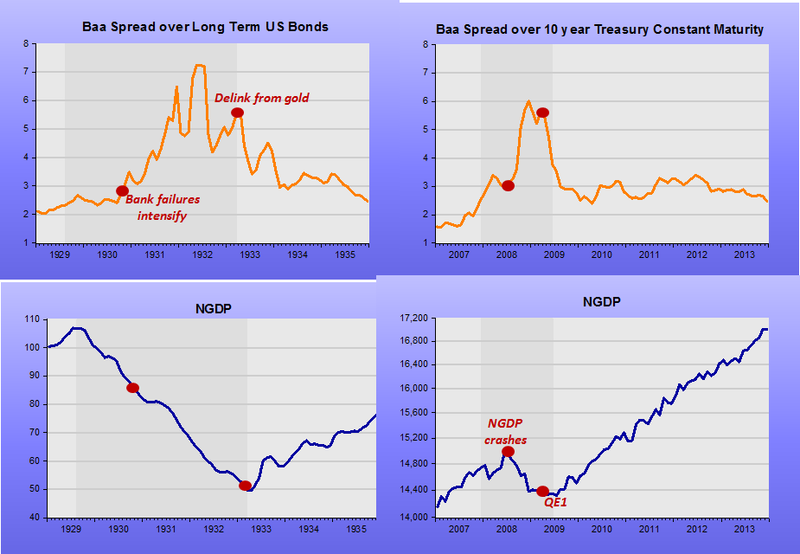 Without going in to all the details, the fact is that Bernanke allowed NGDP to fall in “Great Depression style”. As mentioned, he avoided a second “GD” by bailing-out the financial system. In addition, by introducing QE in March 2009, monetary policy reacted much more quickly than in the “GD”. However, notice the difference. 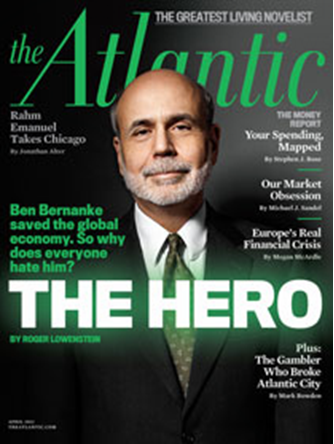 In Bernanke´s case, monetary policy was just sufficient to put the economy on a growing trend along a lower level path. It never tried, as happened after March 1933, to get back to the original trend path. Thus, the economy is stuck in a “lesser depression” a.k.a. “Great Stagnation”. And that really has nothing to do with fiscal policy. What the Fed wants, the Fed gets! Broadly, economists expect the economy will strengthen later in the year, but it remains to be seen if growth can breakout of its about 2% pattern recorded for most of the economic expansion that began in mid-2009. Even a rebound to a 3% growth rate in the second quarter would still result in a sluggish expansion for the first half of the year. The concept of “strengthen” is vague in the context. And there´s nothing to indicate that “growth will breakout of the close to 2% recorded pattern”. The charts give a good visual. 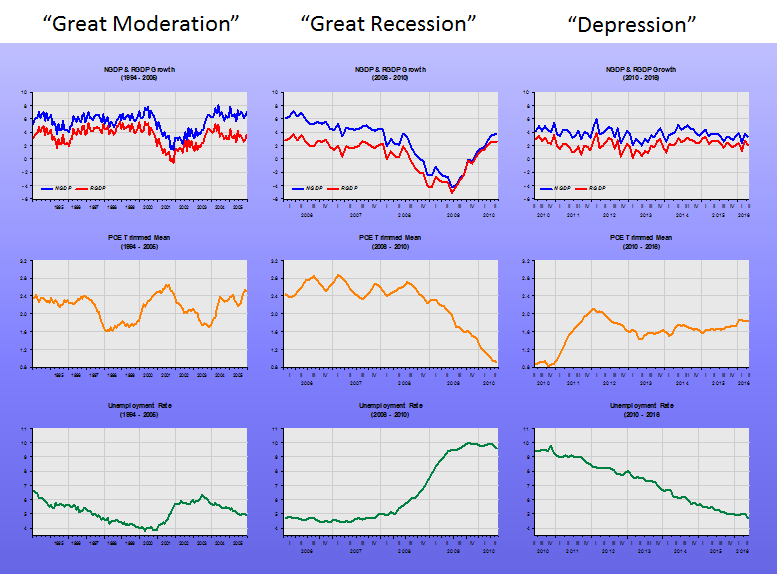 In the first, I blocked out the (extended) Great Recession period. 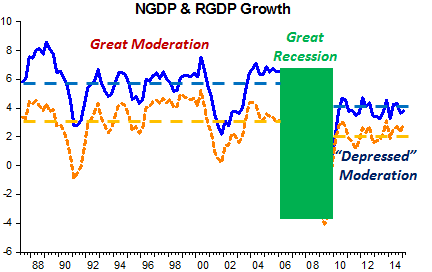 Note how nominal and real growth have come back at reduced speeds, which I named “Depressed” Moderation to contrast with the “Great” Moderation that took place from 1987 to 2007. 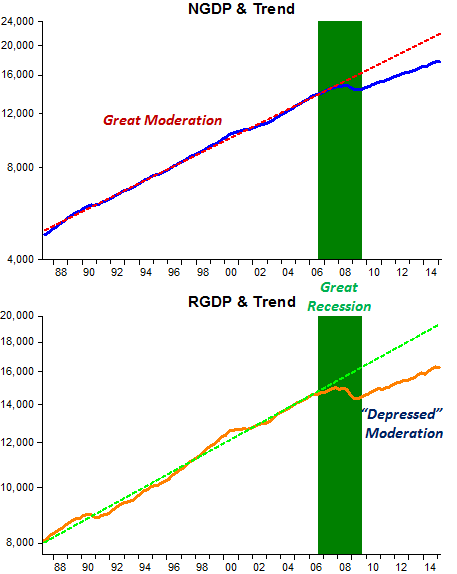 In the levels chart below, you can see how the economy has been “downgraded” to the “Depressed” Moderation. The important thing to note is that that´s exactly where the Fed wants it to be. If that´s true, there´s no chance the economy will brakeout of the “recorded pattern”. Federal Reserve officials forecast the economy to grow between 1.8% to 2.0% all this year, according to projections released earlier this month. That would represent a slowdown from the 2014 rate. Note: The Fed knows what it wants! 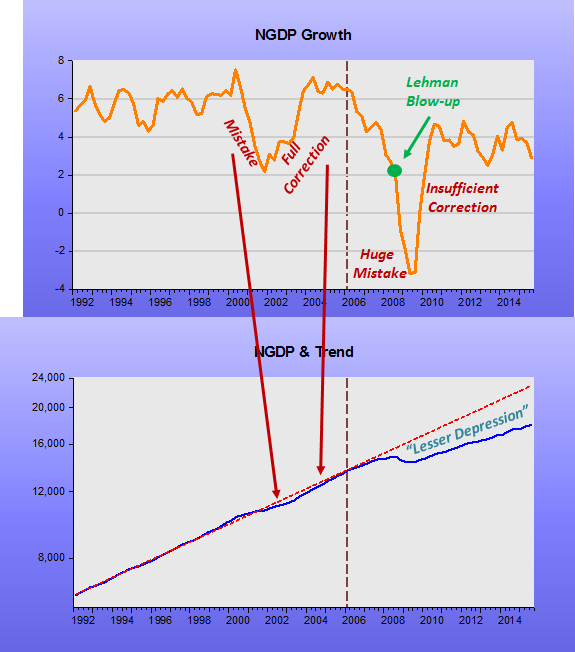 DeLong gets desperate and blames the Great Recession on Friedman! You’re right, we did it. We’re very sorry. But thanks to you, we won’t do it again. 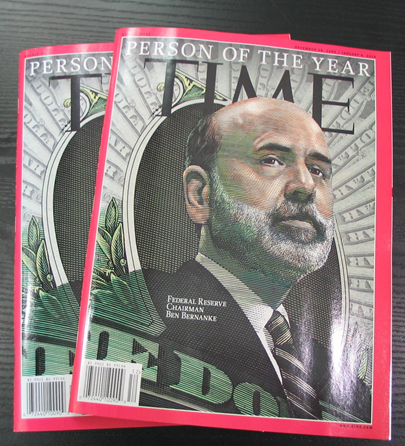 And right now Ben Bernanke, now at the Brookings Institution, has changed his mind. He is now calling for Keynesian cures–expansionary fiscal policy, especially infrastructure spending, as the bet road forward. And because the intellectual victory in the 1970s and 1980s was complete, policymakers in 2008-2010 were hesitant and unwilling to apply the Keynesian and Minskyite cures to severe downturns enthusiastically enough and on a large enough scale to adequately deal with the problems that emerged. When the collapse came, the economists advising the North Atlantic’s governments and central banks were not ready. Why did the collapse come? Start with the huge rise in wealth among the world’s richest 0.1% and 0.01% from the 1970s into the 200s, and the consequent pressure for people, governments, and companies to take on increasingly unsustainable levels of debt. Continue with policymakers lulled into complacency by the widespread acceptance of the “efficient-market hypothesis”–believing that investors in deregulated financial markets were relatively good judges of risk. End with hubris: the confidence in the Federal Reserve and elsewhere that grew because the Penn Central collapse of 1970, the Latin American financial crisis of 1982, the stock market crash of 1987, the S&L crisis of 1991, the Mexican crisis of 1995, the East Asian crisis of 1997, the Russian/LTCM crisis of 1998, and the dot-com crash of 2000 had not caused the Federal Reserve problems that it could not handle well enough to keep the unemployment rate from going up by more than two percentage points. The reasoning can only be a bad sign of the times!